The College's MBA program has been named one of the top 10 in Minnesota in the Dec. 5 issue of Minneapolis/St. Paul Business Journal. The list ranks MBA programs by Fall 2014 enrollment size. St. Scholastica landed in the number 10 position with 177 students. 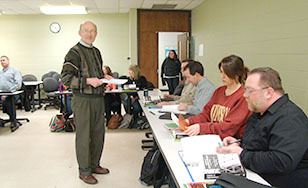 The College's MBA is characterized by flexibility, with evening classes offered on its campuses in Duluth, the Twin Cities and St. Cloud. "We are very proud of our graduate programs and their faculty, students, and alums," said Jim Gearity, dean of the School of Business and Technology. "They richly deserve this recognition." Program applicants can complete the program in as few as 16 months. Along with a broad business knowledge base, programs focus on building cultural competence and ethical understanding. Students can choose from five concentrations: business leadership, finance, healthcare leadership, IT leadership, and marketing.